Funny-Manual design, offers much more enjoyment of making coffee. Convience-Lightweight and portable, convenient to carry. Durable- Compared with a metal burr, ceramic burr never rust, enhancing durability and keeping your coffee tasting fresh and natural. Perfect Coffee Lover Gift-Perfect for both the traveler and the home coffee connoisseur.The ideal grinder for the coffee enthusiast. Useful-Stainless steel handle,saving more effort,Grinding more evenly.Independent, food-grade silicone cover. Bottle is made of natural heat-resistant glass.The powder storehouse independently, as a separate sealed containers. High Quality-Coffee grinder made with advanced quality diamond-strength ceramic, stainless steel parts. Glass container Non-slip base makes for easy use. Compared with a metal burr, ceramic burr with temperature stability, never rust, enhancing durability. Widely Used -Coffee Mill Grinder is small, lightweight and portable making it perfect for use at somewhere.Only the best materials are used to bring you this well-built, durable, reliable grinder to use in your home or office or while backpacking or camping.And for kitchen, uniform coffee grinds also great for grinding grain, nut and seed spices. Easy to use -Silicon lid is soft to touch and convenient to add beans.Grinding Core Upgrade,can be washed easily, no metal smell, avoid raw heat affecting flavor.After each using,the body of coffee grinding can be wiped with a damp cloth, the movement is not need washed with water every time, you can clean with a dedicated brush. Adjustable-For a precision grind, the fineness of coffee grinding can be controlled by adjusting the shim. Easily and quickly adjust to the size you need.It is extremely user friendly and perfectly grinds the beans for your morning espresso. 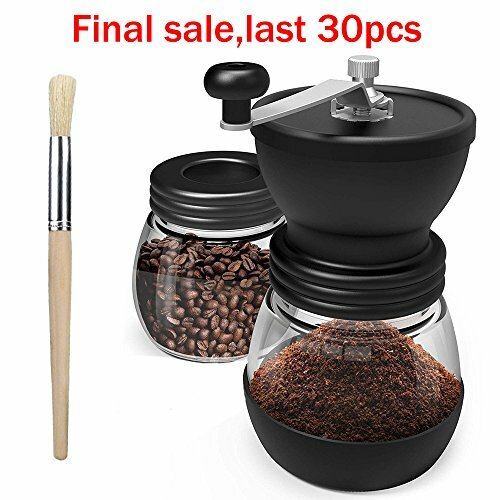 Surprised packages with Adjustable Ceramic Burrs , Two Glass Jars，Stainless Steel Handle And Silicon Cover Free Cleaning Brush.Convient to use and storage, with Ergonomic Design. If you have any questions about this product by Limpio, contact us by completing and submitting the form below. If you are looking for a specif part number, please include it with your message.